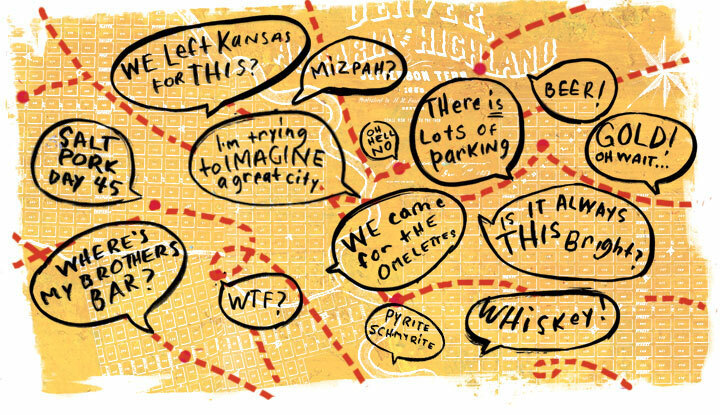 Denver is a square, proud, prompt little place, surrounded by immensity. Denver is the unlikeliest of cities; there’s no port, no access to an ocean or a major river, nowhere to get to (easily) between here and there. Compared to other urban centers, it came late to the party, and unnaturally, forced on an unwilling landscape. Started by claimjumpers and promoted with false claims of easy money, there was never any gold at the confluence, but there was an opportunity to set up a transportation hub in one of the less explored and exploited regions of the country. In the first two years, 100,000 people came through looking to find a fortune; by 1864, the city had less than 5,000 residents and was practically destroyed by flood and fire. For those still here, isolated in “this god-forsaken place,” it may as well have been the end of the world. It was touch and go until the railroad came in in 1870, setting off one of the first of Denver’s booms. Maybe it was the boom and bust cycles, or the latecomer status, or the distance from centers of culture, but for much of the city’s history it’s been better known as a place to go through, rather than a place to stay. You may thank your stars that you left this country when you did, for it is deader than it ever was. The fact is I am getting damn sick of this God-forsaken place. One hundred twenty years later, in the late 1980s, the oil bust wreaked havoc on the Denver’s economy; people were jumping ship for wherever they could make a living, and mostly anywhere was better than here. Downtown was sleepy and lonely (especially after hours), and the skyscrapers that had been built in the 70s emptied out as fast as they went up. The good news? Parking was plentiful and free. One of the many odd jobs I had at that time involved emptying the offices (cubicles and desks mostly) from the Arco Tower on 17th Street in Downtown. For weeks, we loaded the furniture on carts and rolled them onto semi-trailers destined for warehouses in Texas. The wealth (and jobs) that had been imported left town when times turned tough. Looking at the empty storefronts in the Arco Tower, my buddy Ray and I proposed to the property manager that we install a series of temporary artworks that would show the space off while also having a sense of humor. Our proposal? Cows. Denver, we thought, should embrace its traditions, and engage in a fun dialogue to encourage people to come back downtown. It sounded good to us. But not to the property manager. Anything but cows, he said. From its founding 150 years ago, Denver’s residents have described the city with a combination of self-deprecation and boisterous civic boosterism, sometimes with more than a touch of defensiveness. But along the way, something has changed, and there is a bit of self-confidence that doesn’t seem so out of place; there’s a willingness to embrace both the city’s frontier roots and its urban existence. Denver is no longer so oddly placed in the middle of the frontier. The world has changed. Denver was an accidental city, but now it has grown to become a metropolitan center. Maybe now we can look back with some pride and just a little bit of nostalgia for our cowtown past. Previous PostPrevious What’s A Buckfifty?